First Impression I downloaded this game after it's sequel had come out, so I wasn't really amazed, but the game was still fun! New levels, same old enemies, but the game's cool! This is small in size, so get it! What It's Like You are a crab. Push blocks on your enemies to kill them all in under 90 seconds to proceed to the next level. Every level has it's own tile set, plus a different layout and different numbers and types of enemies. This game is fun! Other things you should know Angelo says this is his first program, but I don't believe that. 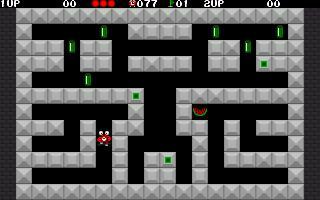 This has four star graphics, but since each level has it's own tile set and the graphics are animated, they are better! Graphics This game doesn't have the best graphics, but they are pretty good. 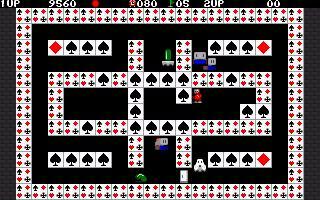 However, each level has it's own tile set, and all enemies and your self are animated, plus there are tons of power ups and stuff with their own graphics! The sheer number makes them better! No repetitive graphics here! Sound There is no sound. Flexibility/Features Many cool features in this game! There are tons of things you can pick up to get extra points, animated graphics, plus levels with their own tile sets! However, there should be things to give you special powers like to walk faster or shoot fire out of your claws or something else neat. Gameplay/Control Numerical arrow keys make you move, enter makes you push a block. That's about it, except for the keys to quit and pause and to select from the main menu. Simple and effective, but sometimes you can't stop walking. You walk too far and die, or you go too far and lose your change to kill an enemy. Poor control, but very simple. Overall Impression This is a great game with many cool things like enemy AI, many graphics, smooth scrolling, a good font, and a complex program! It is also very original and simple and fun. It has great replay value also!